Andrew Cate is a film enthusiast and aspiring screenwriter who recently completed his MFA in Screenwriting. When he was ten years old his cousin tied him to a chair and forced him to watch Stephen King's It and from that point on he was terrified of all things horror. Thankfully, he grew up and now claims himself a member among the horror aficionado crowd. His favorite horror flicks are of the horror-comedy sub-genre and he worships at the altar of Sam Raimi and the Evil Dead trilogy. 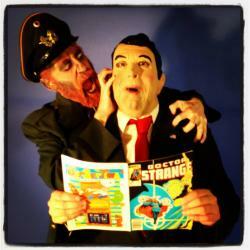 And yeah, I'm the one in the Reagan mask getting eaten by a zombie.